It was mixed trading today as a sharp sell-off in technology stocks outweighed gains in telecommunications and financials. The Dow Jones industrial average jumped to another record high on Wednesday and rose 103 points or +0.44% in another broad rally as US GDP growth in Q3 went up 3.3% exceeding economists' expectations of 3.2%. The advancement of the Senate tax bill and the possibilty of a full Senate vote on Thursday along with Federal Reserve nominee Jerome Powell's commitment to stick to the current chair Janet Yellen's policies also added to momentum. With the US economy on high revs, technology stocks fell out of favour posting the biggest losses putting pressure on the S&P 500 which slid -0.04% and NASDAQ fell -1.27%. The market's main mover today was a clear investor rotation from techs to banks according to analysts. Among the losers in technology stocks were Apple down -2.07% and Microsoft fell -1.81%. Leading the winners were United HealthGroup up +3.12%, Verizon Communications up +2.21% and JP Morgan up +2.34%. Visa fell -3.09%. Small caps closed at +0.32%. In commodities, gold, fell -0.85% to $1,288.3 per ounce. Brent crude fell -1.3% at $62.79 a barrel and US benchmark WTI dropped -1.05% to $57. As reported by Reuters, outgoing Federal Reserve Chair Janet Yellen told Congressional leaders on Wednesday in her final scheduled testimony on Capitol Hill that the US economy has gathered steam this year and will warrant continued interest rate increases amid a strengthened global recovery. 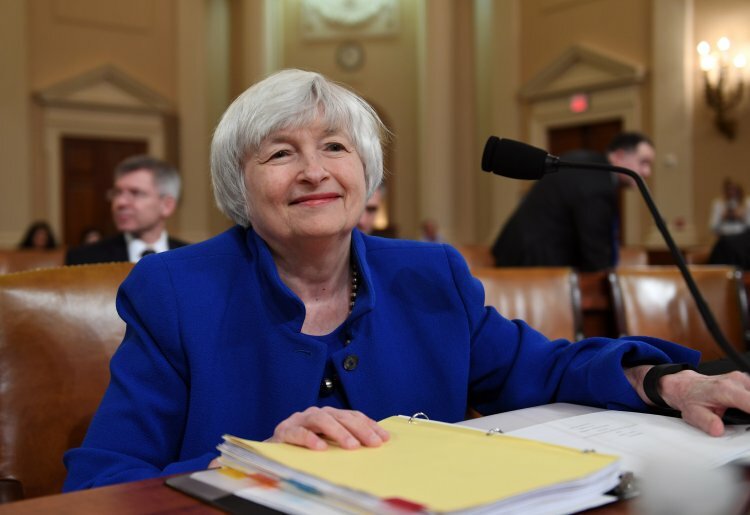 Her valedictory session before the Joint Economic Committee described an economy where the jobs market remains strong and economic growth has hit 3% for two quarters running, above the Fed’s estimate of US potential and likely enough for an expected December rate increase. It also became a forum for a subtle challenge by Yellen to some of the ideas underlying the Republican tax plan, particularly the idea that a corporate tax cut would increase workers’ wages. Quote of the day: "The volatility in the Nasdaq 100 on Wednesday is something that investors should get used to in the new year. Next year, we will also see broad-based selling based on valuation, and when that happens, the good stocks will be taken down with the bad, just like we are seeing today." writes Thomas H. Kee Jr. founder of Stock Traders Daily in MarketWatch.